Twin fifties by Umar Amin and Kieron Pollard helped Peshawar Zalmi surge past Multan Sultans' total of 172 for a seven-wicket win in Dubai. Sultans got off to a red-hot start reaching 65 for one in the Powerplay, after being sent in, and continued to cruise behind Johnson Charles' 26-ball half-century. But after Charles fell in the 13th to leave them at 114 for two, there was no finishing kick. By comparison, Zalmi had a much slower start but paced their chase well. Amin played the anchor role in a 50-run third-wicket stand with Imam-ul-Haq before continuing to play second fiddle to Pollard in their unbeaten 91-run stand. 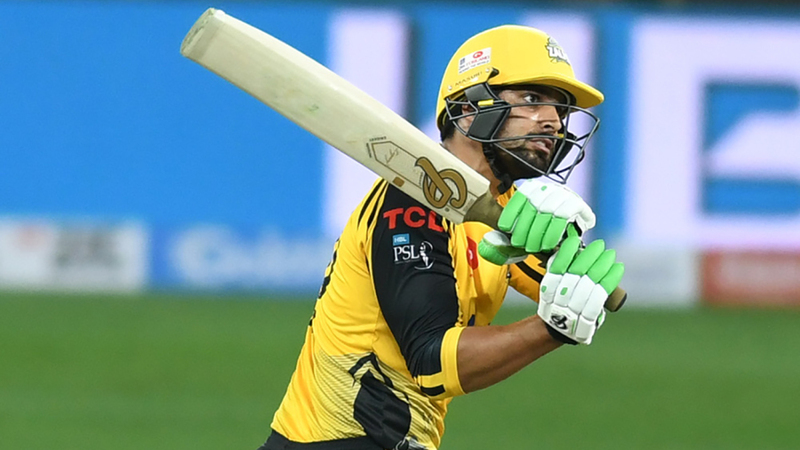 His seventh four in a 37-ball 54 ensured Zalmi got across the line with four balls to spare. The result completes a season sweep for Zalmi over Sultans after they overcame another Charles half-century just four days earlier. Charles got going in the sixth over, hitting Wahab Riaz for four boundaries. Six of his eight fours ended up coming off the left-arm quick, including the one that brought up Sultans' hundred in the 11th over. Liam Dawson got lucky in the 13th when a half-tracker stayed very low to slip under Charles' attempted pull, bowling him for 57. Zalmi needed 54 off 26 balls and Pollard was on 14 when he skied a pull off Mohammad Irfan to Charles at deep midwicket, but the fielder fumbled a fairly easy chance. Pollard struck Junaid Khan for six over midwicket off the very next ball he faced in the 17th, then clubbed three sixes in a row to end the 18th and bring up a 25-ball 50. Suddenly, Zalmi only needed 13 off 12 balls. Zalmi's pedestrian Powerplay - 39 for two - meant they were behind the asking rate for much of the innings before Pollard came to the crease in the 12th over. After getting off the mark with a six against Shahid Afridi, he made the most of the second life offered by Charles. In the span of three balls, he took the required rate down from more than 12 to a shade over six heading into the final two overs. When on ten, Imam went to pull a good-length ball from Mohammad Ilyas in the fifth over but missed, resulting in a severe blow to the unmentionables. After a four-minute delay for treatment from the physio, he was finally able to resume and eventually made 39 before he was stumped charging Afridi. Zalmi's fourth win draws them level with Islamabad United and Quetta Gladiators on eight points, but they top the table thanks to a vastly superior net run-rate. Sultans remain in fifth place on four points, fractionally ahead of Karachi Kings on net run-rate.